Here's a superb new online slots game from Eyecon gaming. A 99 Ice Cream and a flake, name a more iconic duo and we’ll be waiting. When those hot summers days arrive, and the heat becomes hard to bare so much to the point you feel agitated. It only feels natural to raid your freezer or if you’re one of those lucky people that see’s the ice cream van pass through your street every so often then I personally envy you. Or maybe your one of these people who are sitting in the winter season and have those Summer blues and wish to bring back the nostalgia of those care free days. 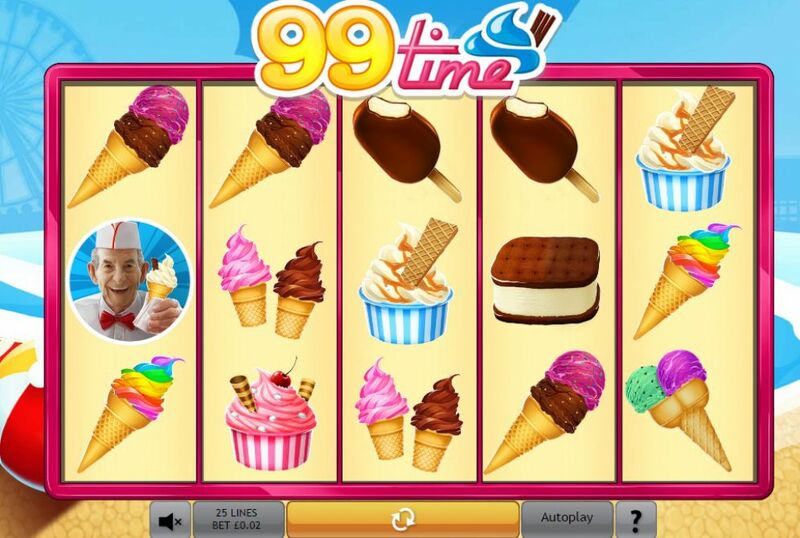 Whichever your situation we firmly believe the 99-time Jackpot game is the closest you will get to accommodating both of those issues, a game which simply adds to your summer hype or brings back the memories in those cold winter nights. Eyecon, well what can we say about them that hasn’t been said already. 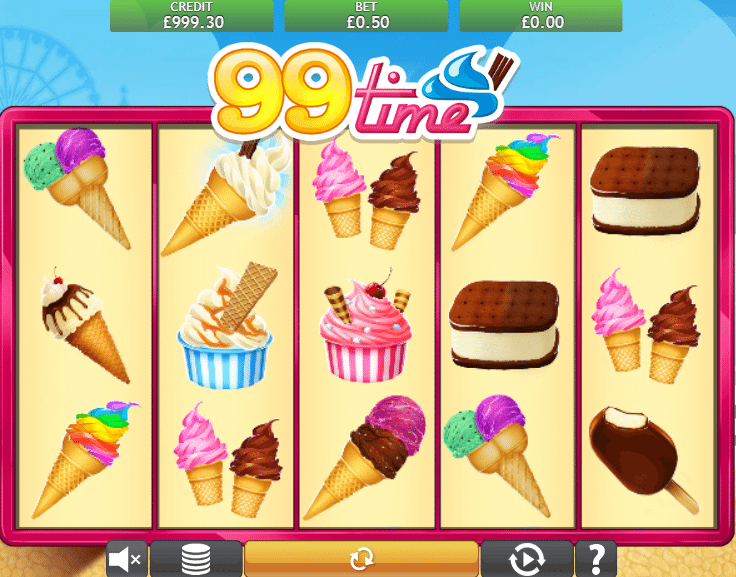 They have produced a game that typifies the United Kingdom Summer tradition in 99 Time Jackpot. A famous combination that has never melted, a revolution of somewhat that has spread throughout the generations since the craze began in the 1920’s Portobello, Scotland. So, it seems they’re not only famous for their Fish & Chips after all. Eyecon continue to deliver with these big games that represent tremendous themed that are recognised by everyone and therefore Eyecon have become so successful as they are absolute experts at what they do. A Jackpot version of the original slots game, 99 Time Jackpot gives punters the opportunity to play for the ultimate Jackpot prize. The game itself boasts the traditional 5 reels with 25 pay lines. The backdrop shows a stunning view of the Blackpool beach and its famous features such as the huge Ferris wheel that dominates the skyline, almost enough to trick you into thinking you were in Los Angeles as you spin your way to that jackpot prize. The symbols that come before this won’t come as a surprise to you as it shows all the things you would dream of when you think about Ice Cream. An Ice cream van, a 99, popsicles, sundaes, Ice cream maker and general variety of different flavours to wet everyone’s appetite. The van is the flake to your Ice cream in this game (In other words it’s the Wild card) so be sure to stay alert always as this can generate double pay outs and free games. Over 3 Ice Cream makers will provide you with a ‘topping pick’ option, each pick can determine how much your stake is multiplied. The 99 symbol is the symbol of all symbols with the highest pay-out of 5,000 coins. A fantastic production from the Eyecon team and one that continues to grow its popularity in the jackpot market. A game for all punters with a stake value ranging from 0.01 to 0.50. For all the players who love the 99 Time Slot game need to check this Jackpot out!